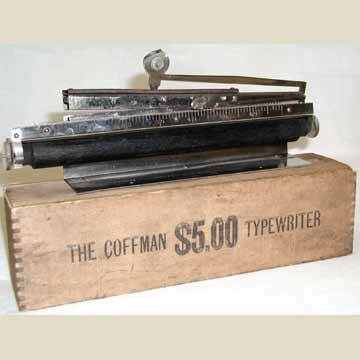 The Coffman typewriter was a cheap linear index machine that hit the market for a brief period in 1902/1903. In fact, two versions of this primitive portable were made, with and without a platen. The Coffman without a platen printed directly onto a flat piece of paper. The model on this page is the one with a wooden platen. At 5 dollars the Coffman typewriter was not the best buy imaginable at the time. From the point of view of modern collectors, the 5 dollars would have been an excellent investment. The machine is extremely rare today.